Have you about had it with the media's constant East Coast bias? Fed up with a nonstop diet of all Yankees and all Red Sox all the time? Have you had about all you can stomach about A-Rod and A-Rod's steroid use and A-Rod's cousin and A-Rod's labrum and A-Rod's divorce and A-Rod's obsession with Derek Jeter and A-Rod's sunbathing habits and A-Rod's relationship with Madonna, who reportedly told someone A-Rod "has the heart of a poet trapped inside an insanely gorgeous body"? -- you're in luck. Because after some down seasons, this year the West Coast has the perfect antidote to the East Coast bias. It has a 45-year-old pitcher closing in on 300 wins and 5,000 strikeouts, the return of the sergeant at arms of the Delta Tau Oakland fraternity house, the long-awaited homecoming of the outfielder who saved baseball in Seattle and, of course, a certain Los Angeles outfielder so much bigger than life he belongs in the Disney animation studio instead of the Dodgers' clubhouse. The West's biggest star, however, is that unassuming little San Francisco pitcher with the exploding fastball and the funky delivery straight out of the Looney Tunes book of pitching mechanics. We're talking, of course, about Tim Lincecum's digital double in the "MLB 2K9" video game commercial. "The likeness of it is pretty similar, but it looks like pre-Cy Young Timmy, not post-Cy Young Timmy," San Francisco teammate Rich Aurilia said of Digital Lincecum. "They need to trim him up there. The hair is kind of ratty on the little video guy. Tim still has the long hair, but it looks a little manicured. He had somebody clean him up pretty good." Indeed. Human Lincecum still is polite and graciously signs endless autograph requests, but he has gone ever so slightly Hollywood. In addition to the new hairstyle and orthodontic work, he fielded questions one morning while lying on the floor next to his locker with his head resting on a equipment bag. He seemed so cool and relaxed that it was surprising he didn't have cucumber slices over his eyes. 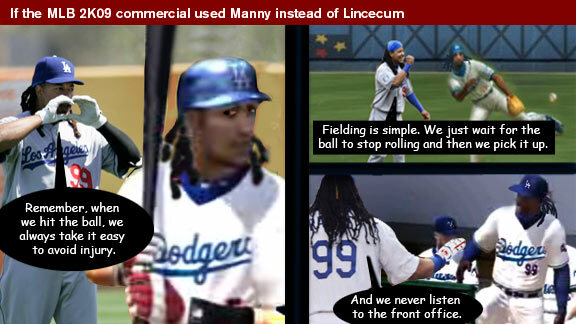 Lincecum is not only the lead pitch man for "MLB 2K9," but he also is perhaps the best advertisement baseball has for advancing beyond the steroids era. Unlike San Francisco's former superstar, Lincecum looks like a normal guy (he is charitably listed at 5-foot-11 and 160 pounds), acts like a normal guy and has yet to be charged with either perjury or an ever-expanding cap size. "I think younger fans relate to him," Aurilia said, "because, one, he looks so young, and two, he's an average-size person, or below-average size, with an extreme ability to do something." Despite his height, Lincecum has the sort of fastball you might expect to see from 6-10 Randy Johnson, who happens to be in the same Giants rotation this season. Johnson will turn 46 in September yet is still throwing smoke in the 90s. Johnson is five victories short of 300 and needs 211 strikeouts to join Nolan Ryan as the only members in the 5,000 K Club. Which is fitting, given the importance Nolan's instruction played in transforming Randy into the greatest left-hander since Sandy Koufax (and -- dare we say it? -- perhaps better than Koufax). Johnson was in the Kingdome in Seattle the night Nolan's career ended abruptly with a torn ligament in his elbow, and he remembers visiting the pitcher in the examining room. "Our doctor had already been in there, and I asked him how he felt, and he said, 'Not good,'" Johnson recalled. "I felt bad because there was a living legend and that was his last year. It's too bad it ended that way. Toward the end of your career you want it to end the way you envision it. You don't want to have it ended for you." The most famous denizen of those Kingdome days is back to apparently end his career in Seattle. Ken Griffey Jr.'s return to the Mariners after nine years away spurred an additional 25,000 ticket sales in the first four days and made even the oldest fans feel young enough to Twitter the news. Standing in line for M's tickets. Can't wait to see Junior and Ichiro together. Think Edgar has anything left? "Forget the fans, that's going to be impressive for me to see," Angels outfielder Torii Hunter said of the Junior-Ichiro pairing. "I'm sure the fans will enjoy it, watching those guys, Hall of Fame players. Griffey is like the Golden Boy, and Ichiro is like Michael Jackson. I mean, the old Michael Jackson, when he was doing 'Beat It.'" Oakland has its own prodigal son returning. He's older, and his hair is considerably shorter -- "I'm getting too old to grow it out long," he says -- but Jason Giambi is determined to return the Athletics to the days when their clubhouse "was like a frat house." And if Giambi, i.e., Frank the Tank, doesn't provide enough star power in Oakland, there is Brad Pitt, who is rumored to portray A's general manager Billy Beane in a movie version of "Moneyball." "I don't know if that's a good fit," Giambi said. "I think Billy is a little better-looking." Even with Griffey, Johnson, Giambi and Lincecum, the top of the West's nondigital, flesh-and-blood, oxygen-breathing A-list is fittingly down Hollywood Way. Manny Ramirez, who waltzed past the velvet rope that is Los Angeles last season, re-signed with the Dodgers during the winter to make fans stand up and cheer when he swings the bat and tear out their hair when he plays in the field. This year, the Dodgers moved their spring training home from Vero Beach, Fla., to a complex in Glendale, Ariz., about two miles off the 101 freeway, and Manny nearly cleared the highway one night with a massive home run off Mariners pitcher Ryan Rowland-Smith. Owner of the first hyphenated name in big league history (take that, A-Rod), Rowland-Smith is from Australia, where his friends' knowledge of baseball is limited to Babe Ruth and the players who were on the softball teams on "The Simpsons." They did know something about Manny, however, because of the afternoon he spent fooling around with a cricket bat in a promotional video. "Everyone back home asked me, 'Who is that guy hitting the cricket ball?'" Rowland-Smith said. But how to explain Manny Being Manny, anyway? "I'd try to compare him to someone in Australia," Rowland-Smith said, "but I don't know anyone you could compare him to." Hell, there isn't anyone here to compare him to. Unless, of course, the digital Manny in "MLB 2K9" is occasionally unavailable because he's meeting a digital rival for dinner somewhere. And speaking of "MLB 2K9": If Lincecum were to have a digital double, what chores would the pitcher have him do so he wouldn't have to? "That's actually a good question," Lincecum said. "If he drove me to the field, that would be awesome. Ideally, in the commercial he would be the one driving and I would be singing in the passenger's seat." That would be awesome. So let New York and Boston think they're the center of the universe. We'll just be out here cruising along the Pacific with the top down, the music way up, box seat tickets to see Junior, Manny, Randy, Ichiro, Lincecum or the Angels burning in our pockets and a season of possibilities so promising that not even the finest computer graphics could do it justice. Plus, the Red Sox, Yankees and A-Rod are all scheduled to make West Coast road swings. CC Sabathia is the most disconcerting of players for Yankee haters: He's a refreshing and friendly guy you genuinely want to see succeed. And succeed he has. He won the 2007 Cy Young Award and risked his free agency (if only slightly) last season by pitching on short rest to get the Brewers into the playoffs for the first time in 26 years. It was just the fifth time Sabathia failed to strike out at least one batter and the first time since 2005. Worse, as ESPN.com's Jerry Crasnick pointed out, only four times did a batter swing and miss at a pitch. But hey, it was only one game. Sabathia is given to getting too amped for a big game, so it's likely he'll return to his usual form before long. And given his $161 million contract, the Yankees' aging roster and the competitive AL East, the team needs him to find that form sooner than later. Carlos Zambrano's comment that the Cubs need a new ballpark along the lines of the new Yankee Stadium may be heresy, but his views should not be entirely rejected, either. Don't get me wrong. Wrigley Field should not be replaced. No, please, never. But although Wrigley holds as much appeal to fans as the team itself, that's part of the problem. For years, it seemed as if the club and fans were content with playing in baseball's own Wayback Machine. The fans certainly have changed (their famed long-suffering patience ended with the 2003 playoffs), and now it's up to the club to make some changes as well. The Cubs don't need a new ballpark to replace Wrigley Field, but they need to update, expand and improve what they have. I used to prefer Wrigley to Fenway, but no longer. New club owner Tom Ricketts needs to copy the Red Sox's model and buy adjacent property so the Cubs can add concession areas for the fans and improve training facilities for the players. The Red Sox have improved Fenway Park dramatically in recent years while carefully preserving its essential history and character. They also have mined the park for revenue that has helped transform them into baseball's most powerful team, both fabulously rich and fiscally prudent (well, prudent by baseball standards). The Cubs could do the same. Plus, would it be so wrong if fans could get a decent sandwich or slice of pizza at the concession stand? So was spring attendance up or down this year? It depends on how you look at it. According to an Arizona Daily Star story, Cactus League attendance was down 14 percent per game. But because there were more teams (the Dodgers and Cleveland moved to Arizona) and an extra week of games (thanks to the World Baseball Classic), overall attendance was up by almost 24 percent (1.6 million fans from 1.3 million). There were days when the Dodgers and Cubs traded daily attendance records, and at least one day when the Giants drew such a small crowd at Scottsdale Stadium that you literally could hear the grounds crew dragging the infield. Before his opening day shot off Francisco Liriano, Ken Griffey Jr.'s last home run as a Mariner was Sept. 22, 1999. Junior was considered perhaps the game's best player at that point, but the past nine years haven't been very good for him. During Griffey's 11 years in Seattle, he received MVP votes nine times (including five finishes in the top five), 10 Gold Gloves and 10 All-Star nods. In the nine seasons he was gone, he received an MVP vote only once (24th in 2005) and won zero Gold Gloves. He also played on only one winning team (2000). Here's hoping the return to Seattle also triggers some return to his old form. With the discouraging announcement this week that the Mariners will move 2007 first-round pick Phillippe Aumont to the bullpen (at the Class A level), plus the use of 2006 first-round pick Brandon Morrow in the (insert loud, menacing music) "closer" role this season, Seattle now has used its past three first-round picks on relievers. (The Mariners drafted closer prospect Joshua Fields last year.) That's ridiculous. You don't waste first-round picks on relievers. You claim them off the waiver wire. You get them as the secondary player in a trade. You put them there when you find out they can't start. Always looking for more revenue, the Red Sox are releasing an album of the Boston Pops playing the team's greatest hits. So if you ever thought that what the world really needs was a symphony's recording of "Sweet Caroline" and "I'm Shipping up to Boston," your wait is over.